Asian art prints for the home. Add color instantly. Originally a depiction of an antique Japanese village, the giclée reproductions captures a panoramic of the screen across a quadtych design. Forms of gilded bamboo offer a striking statement against an indigo background. The art is designed with a 1" white linen scoop liner and two-tone frame of antique silver etched frame with taupe side. Inspired by nature motifs of birds and gardens in Japanese culture, the art is designed in an antique gold frame with black detailing. Inspired by nature motifs of birds and gardens in Japanese culture, the art is designed in an antique gold frame with black detailing. Handcrafted wall art. Artist: Teng Fei. Handcrafted wall art. Artist: Teng Fei. This textural example of Teng Fei's work is an exquisite addition to a space. The silver-leaf background highlights the branches of the painting. The piece is framed with a black wood molding. Handcrafted wall art. Artist: Teng Fei. This large-scale piece by Teng Fei features a bright cloud of blue. The piece is showcased with a black wood molding. Handcrafted wall art. Artist: Teng Fei. Layer upon layer of monochromatic blocks build an impressive vision in this piece. The fascinating image is framed simply with a black wood molding. An original painting by artist Teng Fei. 51"W x 2"D x 79"T. The canvas is displayed in a black wood frame. Hand-painted original "Stratosphere" painting. By Teng Fei. Canvas is surrounded by black wood molding. 79"Sq. x 2"D.
Layers of rich textural color combine to create this exciting piece by artist Ja Ding. Each piece is finished in a black wood molding. This mixed media piece has lifelike blooms that rain through this beautiful original piece by artist Ja Ding. This large piece is framed in black wood molding. A school of koi swarm this beautifully painted abstract by Ja Ding. The fluid motion is brought to life in the monochromatic abstract background. This piece is surrounded by a black wood molding. Handcrafted giclée on canvas. Dimensional blooms of bright pink pop against the crisp white background. Artist: Ja Ding. Handcrafted giclée on canvas. An virtually cubist vision of an inviting still life shows in exciting colors. Artist: Ja Ding. Handcrafted giclée on canvas. Artist: Liu Mengzhou. Countless layers of color are drawn across this canvas. The beautiful hues are emphasized by a metallic wooden frame. This stunning abstract by Feng Ming showcases color and femininity in this portrait of a young lady in motion. This original oil by artist Chen Qi is a textural explosion of golds, black, and deep grays. The piece is finished with a black wood molding. This hand-painted oil is reminiscent of colorful clouds reflecting the refraction of color of the sky and sun. In 2011, Minh Nguyen and Caitlin Dinkins joined forces to establish Zoe Bios Creative, an art and design house based in Los Angeles. Along with creating their own fine art and innovative home accessories, the duo represents artists that embody the vision that is Zoe Bios Creative - of-the-moment, yet timeless work that epitomizes the spirit of Art Entoure. Striking color and rich texture create impressive movement in this original piece by Liu Mengzhou. Showcasing a decorative pale blue and white urn, the trim of the urn is accented with hand-applied gold leaf. "Above The River" Canvas Wall Art "Buddah" Giclée Canvas Art by Robert Robinson Wendover Art Group Statuette Paintings, 30" x 46"
Handcrafted triptych giclée on gallery wrapped canvas. Hand applied gold gild. Wood tone float frame with gold accent. Handcrafted, hand-embellished giclée on canvas. Artist: Robert Robinson Featuring a regal Asian figure, the giclée reproduction is designed with a 2" white linen liner and antiqued silver etched frame. The giclée reproduction captures rich colors of red, blues and greens. The 2" white linen liner adds depth to the design. The piece feels regal yet modern. Handcrafted wall art. Contemporary figures are enhanced with white croc matting. An assembly of people on horseback convene in the bright artwork. The image has a deckle edge, and is mounted on a neutral background. An ivory white mat surrounds the piece as does a wood molding with a gold finish. Handcrafted giclée reproductions on hand-applied gold leaf panels. Inspired by nature motifs of birds and gardens in Japanese culture, the art is designed in an antiqued gold frame with black detailing. Korean artist Guseul Park views art as meditation - her creations bring her to a state of pure joy. Textural striations draw the eye upward in this vividly-hued print. Korean artist Guseul Park views art as meditation - her creations bring her to a state of pure joy. Korean artist Guseul Park views art as meditation - her creations bring her to a state of pure joy. Textural striations draw the eye upward in this vividly-hued print. Korean artist Guseul Park views art as meditation - her creations bring her to a state of pure joy. With delicate brushstrokes, this piece evokes the feeling of a warm evening spent outdoors. A highly textural abstract in a rainbow of colors. The oil painting is stretched and mounted in a sleek floater frame, which is hand-finished in matte black and aged gold Original oil on canvas from artist Jinlu. Hand painted; each will vary slightly and may not look exactly like the one shown. Palette-knife strokes create the illusion of a multitude of colorful birds perched amid tree branches. Pine floater frame hand finished with slightly textured silver leaf. Framed without glass. This textural piece by Jinlu features a striking swath of yellow on an otherwise neutral background. The Sea Bird has a deckle edge set over a light gray background. An ivory mat is placed over the image, is framed in a narrow molding that is custom finished. The Wounded Foot by Joaquin Sorolla. 25.5"Sq. x 2.75"D. Handcrafted giclée on canvas recreates the original brushstrokes. Wood frame. Made in the USA. Handcrafted framed fine art giclée with hand-applied texture. Canvas. Handcrafted giclée on gallery wrapped canvas. Giclée reproduction of an original by Kelly O'Neal. Textured gel finish. Canvas and wood. Weathered white float frame. Handcrafted giclée on canvas. Brightly painted buoys go from practical to artsy. Handcrafted giclée on canvas with hand-painted details. Artist: Liz Jardine. Silver leaf wood frame. Canvas. 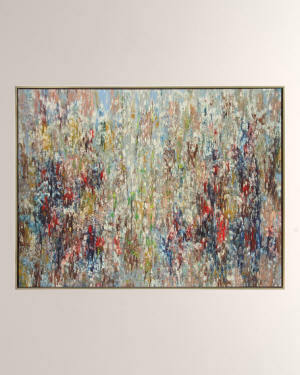 Hand-finished giclée faithfully recreates the pastel colors of Dyann Gunter's impressionist painting Giclée on canvas. Artist: Burrows. This stunning reproduction of an impressionistic seascape soothes with the soft colors of the low-hanging sun above the horizon, positioned just out of view. This dramatic piece by Mary Hong in shades of cobalt blue and cerulean blue features her signature high glass vitreous finish speckled with a mass of tumbled glass. Artist: Mary Hong. Handcrafted giclée on canvas. Hand enhanced with broken glass pieces and an acrylic vitreous finish. Silvery edged wood frame with pale-blue interior. Framed without glass. Handcrafted art features artist's signature high-gloss vitreous finish embellished by a mass of tumbled glass. Artist: Mary Hong. Canvas and wood. Handcrafted art piece features deep moody hues and the artist's signature glass embedded in a high gloss finish. Artist: Mary Hong. Canvas and wood. Brilliant tones of blue dance through this artwork by Maryann Moeeni. The marbleized imagery is highlighted by the aged silver molding. Handcrafted giclée on gallery wrapped canvas. Glass coat finish with silver leaf and faux crystal embellishment. Nature-inspired prints each depict a different variety of coral. Rendered in varying shades of blue, they are double matted in ivory and navy to enhance their beauty. Images are under glass and held within beveled-mirror frames Handcrafted giclée on gallery wrapped canvas. Artist: Linda Donahue. Textured gel finish. Silver leaf float frame. In 2011, Minh Nguyen and Caitlin Dinkins joined forces to establish Zoe Bios Creative, an art and design house based in Los Angeles. Along with creating their own fine art and innovative home accessories, the duo represents artists that embody the vision that is Zoe Bios Creative - of-the-moment, yet timeless work that epitomizes the spirit of Art Entoure. With a palette of fresh, vibrant hues, entrepreneur Dana Gibson's eclectic art is instantly recognizable. Reminiscent of the calligraphic canvases of Cy Twombly, her classical motifs feature delicate crepe textures and eclectic patterns. Featuring a contemporary arrangement of black watercolor brushstrokes with selective negative space and shimmering gold accents, this piece is an elegant addition to a dining room or living space. Handcrafted giclée on gallery wrapped canvas. White float frame. Textured gel finish. Midwestern artist Dawn Sweitzer believes a home should be a luxurious reflection of the people and objects that bring one joy. With that in mind, she infuses each of her contemporary pieces with the techniques she learned while living and traveling through Russia and Europe. This abstract color study boasts saturated cobalts, layered with meandering brushstrokes of soft pink and earth tones and gently coated with a burnish of gold leaf. Handcrafted wall art. Metallic foil with embossed gold and silver leaf accent. Wood and paper. One of 3. Ruti Shaashua's background in textile design influences her kaleidoscopic works, often drawing inspiration from vivid Indian fabrics. Symmetrical patterns and repeating prints create lively scenes bursting with color on each mesmeric painting.